The first thing we need to do is get rid of the toxic carbon tax. It is destroying the joint. After all, emissions went up. Ok, I know that greenhouse gas emissions from the electricity sector are down about 7.6 per cent since the carbon tax was introduced, or the equivalent of about 14.8 million tonnes, and that demand has dropped as businesses and individuals adopt energy efficiency methods, but emissions from coalmine expansion and new gas plants have been soaring. And that’s what we want! More coal and more gas to make our country better. And as for renewable energy, competition like that is bad for the country. It puts up prices. I know normally one would consider competition a good thing but not in this case. Have you seen those wind farms? They are U.G.L.Y they ain’t got no alibi they ugly uh huh they ugly. I know there was some talk of 1 million solar roofs before the election. That information was purely a discussion paper that was inadvertently leaked by a junior staffer who has since been counselled. And that mining tax has to go because it is stopping investment. It may not have raised much money but it has scared off mining companies who will take our resources offshore to develop more cheaply – I’m not sure how, but they will. Don’t you worry about THAT, you people. It’s a well-known fact that people don’t appreciate something unless they have to pay for it. I don’t mean you people who are fraudulently claiming business usage on your cars – we know you love your BMWs. I mean those lollygagging sick people. We will introduce a luxury tax on doctor’s visits and medications so sick people will truly appreciate the help the doctors and chemists are giving them. It is also obvious that we can no longer accommodate all those people who are claiming they are old because of some vague family connection in the past. Far too many people have been using their age to claim entitlements that the rest of us don’t receive. To stamp out this reverse discrimination we have changed the definition of old to “too old to work”. Rather than seeking handouts, we will liberate those who were previously known as old to seek work usually given to other age brackets or to retrain for a new career. Training fees will be deducted from their estate. Our greatest priority is to defend our borders against everyone and everything – asylum seekers, sharks, coral – who knows what deadly menace is around the corner and under a tree. To that end we are amassing squadrons of attack fighter jets, packs of submarines, armadas of orange life rafts, and a whole fleet of fishermen with mates and eskies. They will complement our Navy who patrol our Northern Shores searching for boats that have stopped and our Airforce who patrol the Southern Oceans searching for the Mary Celeste. This will be given an unlimited budget that will go up by whatever the generals ask for each year. We are conscripting our youth into a homeland defence force known as the Green Army which can be deployed to any mine that may be a possible target for whoever is invading – maybe the crown of thorn starfish who already knows that Greg Hunt means business! To help the unemployed get jobs, we will make everyone part-time, pay them less, and make them move away from family who could provide accommodation and friends who could help with transport or share the cost of living. Those who choose to commute, we will make them truly appreciate the cost of petrol by increasing the fuel excise so we can build more roads. This will not apply to anyone making over $1 billion a year. To show that we are all making sacrifices, rich women will only be given $1,923 a week to have babies. Corporate Australia will pay for this through a 1.5% levy on some businesses in conjunction with a 1.5% decrease in company tax for all businesses. That should work….I think. Any shortfall between government revenue and the subsidies and tax breaks that we give to mining companies, banks, private health insurers, and Gina, will be made up equally by all those who earn over $80,000 who don’t have an accountant. Those of you who do have an accountant may continue negative gearing because you are the rock upon which this nation is built. This is our vision, this is our mission….. Brilliant, Kaye Lee. Just brilliant. Kaye Lee, it is just too true to be funny, although it is once again brilliant. ……and a rise in the fuel excise. Just a few one liners that our friends in the Labor party could use free of charge. Wait a minute where are the consultants? Hockey admits Labour’s economy is one of the best in the world. You could also include the fact that all children will receive an education based on Judeo-Christian values and an appreciation of western civilisation, which will ensure they finish their education believing that climate change is a lie, asylum seekers will destroy our country, the Anzacs fought to preserve the way of life to which the rich have become accustomed, all the media says is the gospel truth and conservative politicians know best. They will be able learn all this if they attend a private school, they have no socioeconomic disadvantage, do not have a learning difficulty or disability, they can afford to get to school (petrol costs), are well enough to attend school (medical costs), and their parents can afford to purchase equipment (reduced minimum wages). An uneducated or poorly educated population is easier to control. Thank you for rectifying a crucial omission. The education draft policy had not reached my desk (brain) by time of publication. Let’s add the NBN to that. We don’t want no self-edumacation – we will decide who gets information and how they get it. Or people being able to work from any old where. We have roads to use I tell you, roads! Yet another flag hosted up the flagpole to see who’ll salute : does anybody know who the coalition’s serial leaker is, he or she has got to be dealt with severely ? This time, evidently the Prime Minister has realized that with the end of the carbon tax (eventually) he will need to replace that revenue so we are being asked to applaud the reintroduction of petrol price indexation which was abolished by Howard as even he acknowledged that the fuel excise (a tax) would be subject to his GST (a tax on a tax ) and to continue indexing the excise would be adding insult to injury. But not our Tone, he’s got a budget emergency to contend with. So, all this talk about the lashings of spare coin we would have with electricity prices coming down after the abandonment of carbon pricing is just so much baloney as it will be replaced by petrol excise increases which are, a form of carbon tax. Was it a Chinese Emperor who would send a silk scarf to an enemy with the implied message that if they wanted to hang themselves, this scarf may just assist: Tony, a blue silk tie is on its way, please use it. Real solutions to destroy Australia’s economy. They preach about the importance of a Christian education yet repeal laws designed to protect our vulnerable from racist bigotry. Bloody hypocrites. Jesus would be appalled. I went to a government school, got a scholarship for my degree, and my Christian values mean I care about the poor, refugees, and have taught the dangers of climate change, and environmental degradation. Not everyone is the self-styled capitalistic christian our PM ( actually your PM, I don’t want the sapskull) claims to be. It is NOT glorious to be rich unless you GIVE it away. Pity more people don”t read what Jesus really said. Have a look at the just released WA State budget. This was the State that went the hardest against the Carbon Price and one their attacks was it would drive up the cost of living and especially electricity. Remember for those in WA this will slug them on top of what the Federal government will hit them with. And that will be repeated for all the Liberal States. Double whammy people. No wonder strikes for increased pay are already on the rise, including those involved with Neighbours and a very rare strike in the Catholic Church. They see the tide of rising costs coming under the Liberals at the Federal and State levels so are rightly demanding extra wages to compensate. And the fallout from increased wages will be an increase in prices across the board as businesses also up their prices. Fallout from all that. Inflation and interest rates. Ask Howard how that works. No wonder Costello was horrified at what Abbott is doing and spoke out against it. He can see what’s coming, just as he warned Howard on what would occur if his unsustainable economic policies continued. Winifred, they read what Jesus really said, and Buddha, and Mohammad, and Sai Baba. They just choose to ignore it or think they know better. P.S You will thank me, just trust me. What did you make of that piece of Nick Dyrenfurth’s that you linked to? He said that it’s time for Labor to dump its socialist ideals – a notion I would have thought lined up well with Bowen and Shorten’s social-liberal vision of Labor’s future. On the surface this appears to me to be a recipe for continuing the slide to electoral irrelevance already underway. On further reading however ND seems to equate ‘socialism’ with State ownership of services. A pretty primitive reading of Labor’s reason to exist – no? 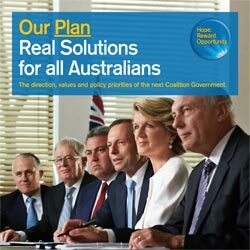 explain why the party was put on this earth: to ensure that all Australians are able to live long, fulfilling lives rich in meaning, living in a good society. I confess I laughed out loud when I read that. It’s all lovely and poetic and hits a couple of emotional buttons, but it’s pretty meaningless in the sense that the Liberals could claim their reason for being is exactly the same, using the exact same rhetorical devices. Seriously, if George Wright sent me an email “blast” containing that sort of thing I’d send it back to him with a definition of “suppository”. I agree the author’s notions of what Labor’s version of socialism should be is primitive. I think the real question now is whether what, if any, version of “Labor Socialism” is salable to the contemporary Australian electorate. I am, for myself, rather stuck in a Whitlamesque universe. For me everything about the Party since then has been a movement toward conservative concepts. I strongly feel it’s not possible to adopt an increasing emphasis on economics – and especially a rationalist approach to such – without the philosophical underpinnings of that spilling over into every facet of socio-economic philosophy and policy. Social and economic policy are necessarily intertwined and I think the former gets informed by the latter in ways we don’t necessarily appreciate until they’ve happened. I think that can be seen in the sphere of industrial relations and how we treat certain economically vulnerable groups. To my mind progressives start form a framework of social justice and equitable distribution of goods. In essence it is neither neo-conservative capitalism nor is it idealized socialism but a framework of social justice and reasonable equity. It can be argued, falsely, that justice is relative however when people have unjustifiable wealth alongside unwarranted hardship and poverty then social relativism dies a quick death ethically. This is just what many on this site are proposing a new and revised set of cultural objectives built upon the fabric of our current political and economic framework that is founded in the practical exigencies of science. Most here are not naive enough to think that we can instantly change the dynamics of capitalism or infuse the world with idealistic socialism what we can do is make a better and more equal world. This does not exclude radical changes to our political and ideological paradigm what it does mean is that we find the practical means to promote equity and fairness. Progressives also rely upon science to provide the necessary foundation of facts that can guide is to a more satisfactory future. Accepting pragmatic laws and rules that have been found to have time honored utility is not conservative. This is just nonsense. Progressives look for progress in many areas of social dysfunction however they are not stupid enough to throw out the baby with the bathwater. What is good about Labor is functionally good and not conservative and what is bad is wide open to criticism. The conservative come socialist divide is a tool of dogmatists not a fair representation of the complex dynamics of any contemporary society. Well said both. Get well quick Dan. Stephen and Dan (and any others who might be interested) With respect to the article by Dyrenfurth discussed above I turned up this link to a speech by Jenny McAllister whose views unfortunately don’t have much weight in today’s Labor Party it seems. What she says seems really sensible to me – if only the rest of the Party thought so. Thanks for that link. It describes what I would like the Labor Party to be. Every day we hear more of the stench of corruption that is politics today. We need altruistic public servants whose reward will be the betterment of all people in Australia and more broadly the world. I am tired of yacht trips and corporate boxes and political donations. This is not democracy. The poor cannot buy access to our Ministers’ offices. We certainly need some sort of drastic change. Politics has been bought by big business who have installed their own puppets to do their bidding. Thanks Douglas. That’s an excellent speech and I agree it’s a pity more of those in power in Labor don’t articulate similar ideas. Heartening though that someone from the socialist left of the Party can still be elected President, even if it’s essentially a powerless job. David Uren (Economics Editor The Australian) has a piece today arguing that the diesel fuel rebate to miners (and others) is fair. Good argument, well for farmers perhaps – they claim $ 700 million a year of the $ 5.4 billion rebated – but miners – they claim over $ 2 billion a year – I don’t think so. Miners and other heavy transport operators, in Queensland at least, are responsible for much of the damage and maintenance necessary on our roads. As for drivers contributing to the costs of roads through the excise, it needs to be pointed out that of the $15 billion a year collected by fuel excise currently, an estimated $ 4 billion is spent on roads. He goes on to argue that the fuel tax applied to business is a tax on inputs and says that it is much better to tax output with, for example, a GST – he does not mention the MRRT in this context. He further argues that an input tax increases prices and reduces competitiveness which may be so but, I wasn’t aware that miners were paying GST were you ? Overall, not a convincing argument to justify miners not sharing the burden and making a contribution to the “budget emergency”.